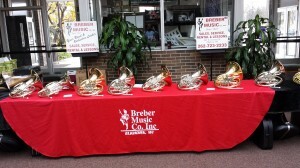 Breber Music is proud to offer an outstanding selection of new and used band instruments, guitars, amplifiers, and keyboards. We also stock all of the accessories you need to get you playing music well right away! We carry only quality instruments in a variety of price ranges from established manufacturers, as well as new offerings from professional-musician recommended companies. We stand behind our instruments! Off-brand instruments can result in poor tuning and performance, increased maintenance costs, and ultimately poor resale value. Buy with confidence from Breber, as our family reputation has been built on quality and service! To find specifics on new instruments, click on the manufacturer’s logos below. Prices and selection do vary while supplies last. To see our most up to date specials, bookmark and visit our front page Monthly Sale Sheet! Call or e-mail your questions and pricing inquiries. We’ll get back to you right away!